My Aunt has a lovely tradition called "Mexican Monday" and I'm always hearing about the tasty-sounding creations she and her family have come up with for dinner that night. So, in keeping with the whole "Mexican Monday" idea, and in honor of my Auntie Jill (just because she's my favorite Aunt, can whip up amazing vegan goodies when she wants to, and is a FREAKING AWESOME COOK!) 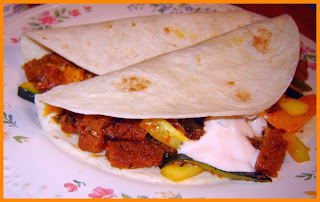 I thought I'd share one of my own family favorites - quick and easy Field-Roast Veggie Fajitas! These were a suggestion - no - almost a DEMAND from my youngest Sprout. She'd been begging me to use the Field Roast Mexican Chipotle sausages I had stashed in the freezer. According to her, they're her "favorite thing in the world and it wasn't FAIR to see them sitting in the freezer every time she opened the door and we needed to use them because they'd been there FOREVER". Well, things don't need to be quite as dramatic as all that; the sausage freezes wonderfully and had only been there a week, but it was a good suggestion, and as you'll see, her idea had DELICIOUS results. Do you have Field Roast products in your area? Oh, I hope so! I feel blessed because they're made right here in Seattle and most grocery stores carry them. Worth trying to find, ABSOLUTELY!!! I promise I'm not trying to sound like an advertisement, but can I just say this is the PERFECT use for the Chipotle flavor sausages? Yummy indeed! I may have to have Mexican Tuesday, and Mexican Wednesday and... Well. You get the idea. Field Roast and similar products can be a stretch for my budget some days, but I consider them a fairly good deal because two 'links' (only half a package) easily provides dinner for the four of us (combined with all the veggies and other goodies, of course!). minced garlic and some tomatoes. You can use any vegetarian meaty thing you want here, but you may need to add spices and seasonings to taste, unlike with the Field Roast, which, as I raved about above, is seasoned JUST PERFECT for this dish. Perfect. Add the tomatoes at the last, just let them soften a bit, and for heaven's sake, don't let the sausage get dried out, you paid too damn much to let it do that!! (Add a little tomato sauce, salsa or even broth if needed, but not so much that you make a sloppy mess). Looks & sounds delicious, Now you've made my hungry!!! Hey -- I have some chipotle Field Roast sausages in my freezer right now, too! I fried up some peppers and onions last night, but ran out of refried beans. Now I know what to add to my tortillas! Mmmmmm!! Ughhh... Those look so good! I just started to diet. If it weren't for that, I'd be making those fajitas tonight!